Divisions on the Right and Left according to Pew Research. 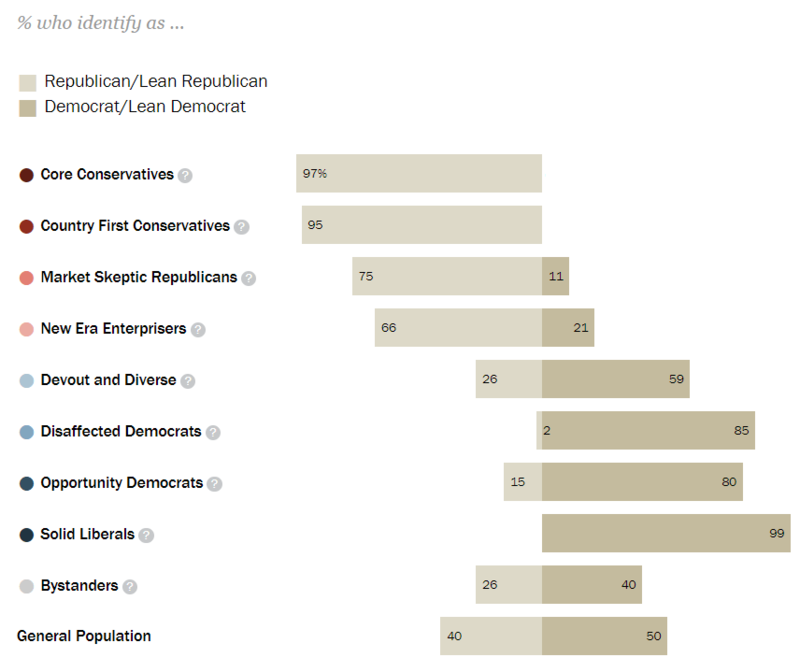 Country-First Conservatives: Older and less educated than other GOP-leaning typology groups. Unhappy with the nation’s course, highly critical of immigrants and wary of U.S. involvement abroad. Market Skeptic Republicans: Stand out from other Republican-oriented groups in their negative views of the economic system. Skeptical of banks and financial institutions, and support raising taxes on corporations. And then somewhere in the middle are the Bystanders: A relatively young, less educated group that pays little or no attention to politics. Here Pew visually represents each groups’ demographics and views on specific issues. Most of the Right is fine with homosexuality, but the County First Conservatives strongly disagree. The Right is pretty divided on whether immigrants burden the US. The Left is pretty divided on whether government regulation of business is necessary to protect the public. The Left is also divided on whether it’s necessary to believe in God to be moral and have good values. Solid Liberals are the whitest group on the Left, at 73%. That’s still less than most of the groups on the Right (85%, 83%, 77%, and 63%), but not by as much as I would have expected. 35% of the Left and 25% of the Right are college grads. The biggest driver of that difference is Solid Liberals, with 57% having college degrees. The most educated group on the Right are Core Conservatives at 33%. Outside of those groups, 17% of the Left and 15% of the Right are college grads. On average the Right is only 5.2 years older than the Left. All the following are weighted averages. I calculated the % each group makes up of the Left or Right using the numbers in this image. I then multiplied the relevant metric by the group’s percent of the Left or Right (e.g. 22% of Disaffected Democrats are college graduates and they make up 27% of the Left, so 6% of the Left are Disaffected Democrats with college degrees).